A warm, sunny day in the Summer is the perfect time to slip on a pair of sandals and enjoy the outdoors. It is, however, unless you’ve got a dead toenail that anyone can see when they pass you by. A yellowed, cracked, or broken toenail is something that is more than just an embarrassing social situation. It’s an indicator that you’ve got a health issue going on! The most common cause of a dead toenail, outside of an injury, is nail fungus. If you’ve ever had athlete’s foot, then you’re familiar with the process of how a nail can get some fungus growing underneath it. A wet, moist environment is the perfect place for some fungal spores to deposit themselves under your nail. Then, when those spores begin to grow and thrive, your nail begins to turn yellow and die. As the infection continues to spread, you may also notice that your toenails may even lift up or curl in on itself. If this is starting to happen to you, then time to begin correcting that problem is now. When your toenail begins to alter its shape, you are at a greater risk of developing painful symptoms of your fungal infection! Onychomycosis (on-i-ko-mi-KO-sis) is a general term that refers to all of the different types of fungus that can cause an infection. That’s right! There’s more than one type of fungus that can cause your toenails to become discolored and even create a dead toenail if its left untreated over an extensive amount of time. there’s a dark color in your nails, caused by debris building up under your nail that you haven’t exposed to dirt or debris. What happens to your toenails can also happen to your fingernails as well! If you’ve got these symptoms and you leave your nails untreated, then there’s a good chance you could end up with a dead toenail or fingernail in the very near future! At the first sign of a fungal infection, you may wish to consult with your doctor to discuss your unique treatment options. That’s because without any treatment, an infection can persist indefinitely. Did You Know That Mold Can Cause a Fungal Infection? Most people focus on the fungi when it comes to a nail infection, but that isn’t always the case. Molds and yeasts also have the ability to invade your toenails and cause the symptoms of a nail infection! Normally, however, what is causing the yellowish discoloration in the nail are dermatophytes. Dermatophytes are microscopic fungal organisms, living organisms, that don’t need any sunlight to live, thrive, and grow. It is true that some fungi serve important functions in this world and let’s not forget that mushrooms make an excellent pizza topping! will only create an infection if your nails are continually exposed to warmth and moisture so that they can grow and spread. Going from a shower to putting on socks and wearing your shoes all day with sweaty feet are a perfect example of maintaining the moisture-rich environment that nail fungus needs to grow, spread, and cause your problems. Keeping your feet dry and cool is obviously a first line of defense, but not everyone can maintain that environment for their feet. How would your boss feel about you being barefoot at work? That’s why finding the right treatment now for your nail fungus is so important. Without treatment, the infection will not go away! Eventually that means you’ll be dealing with a dead toenail. Or two. Or more. It’s true that nail fungus can affect any nail you have. What makes the feet more susceptible to a fungal infection is the fact that there is less blood circulating through your toes than there is around your fingers. Because there is less blood around, there are fewer opportunities for your body to locate the infection. Even when it does, there are also fewer resources to fight off the infection. That’s why nail fungus can go on indefinitely and eventually cause a toenail to die! The primary risk factor of developing nail fungus is surprisingly age. The older you get, the thicker your toenails tend to get. Thicker nails create wider gaps between the nail and the toenail bed, which creates the perfect condition for a fungal infection. If you have problems with your circulation or you live in a moisture-rich environment where mold and moss grows easily outside, you’ll have additional risk factors to develop nail fungus. Having a weakened immune system is also a contributing factor to the development of nail fungus in some people. Diabetes especially puts people at risk for developing a fungal infection because their bodies already have fewer resources to fight off this problem. Anything that reduces the immune system, however, will also increase the risks of developing a dead toenail because of nail fungus. Injuries, having athlete’s foot already, and even just excessive sweating can also lead to an increased risk of infection. Reducing your risks by improving your health or removing the moisture from your feet can all help to prevent a nail infection from occurring, but what if you’ve already begun to develop one? What do you do if your nails are already turning yellow and brittle? Treating Your Nail Fungus Infection Is Extremely Important! You can’t just ignore your yellowed, brittle nails. You can shove them into shoes and hide them from people all you want, but that’s not going to get rid of the problem. If anything, that creates even more of a problem because if you’ve got a fungal infection going on in a toenail and your feet sweat within your sock, you could spread that infection from one nail to another very easily! And sure, you could cut off your dead toenail, but that won’t actually cure your fungal infection. The fungi that is causing all these problems lives at the root of your nail and will literally feed off of your body’s attempts to make that nail grow. You’ve got to go to the source of the infection, the root of your nail where the fungus is thriving and growing, to change the conditions where it lives so that it will shrivel up and die. That’s why you need an effective product like ClearNail Pro+. 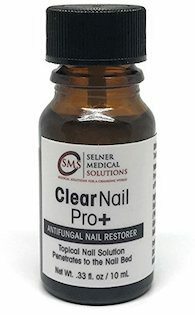 Unlike other fungal treatments for your toenails, ClearNail Pro+ is available without a prescription. Why is it available without a prescription when so many other products need you to spend a week’s paycheck just to see a doctor? Because the ingredients of ClearNail Pro+ have been used by doctors to treat nail fungal infections for decades. They’ve just been using the ingredients in ClearNail Pro+ separately. With ClearNail Pro+, you get all of the all-natural ingredients that doctors have used over time individually in one easy-to-use treatment solution. You’re getting proven ingredients with extremely powerful anti-fungal agents working hard to destroy your nail fungus right at the root. Even if you’ve already got a dead toenail, ClearNail Pro+ can help you to eliminate the fungus that is prevented your nail from growing. In just a few weeks, you can have nails that stopped growing years ago because of a fungal infection begin to grow again! It’s time to make your toenails beautiful. It’s time to be confident when you throw on your sandals for a stroll outside on a beautiful day. It’s time to stop worrying about your toenail discoloration once and for all. It’s time for ClearNail Pro+. Order yours today and make your dead toenail become a distant memory! Is product available in the Philippines? Any recommendations? You should be able to order online and get it delivered.